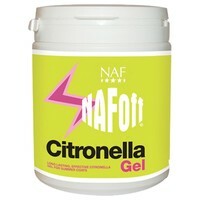 NAF Off Citronella Gel has been developed as a concentrated application to provide long-lasting summer protection for horses’ coats. Completely safe and effective, the gel can be applied directly to the mane, tail and coat, and will protect against flying pests such as midges, mosquitos and flies. Apply a small amount of the gel daily, or as required, by hand or with a sponge. Make sure to avoid the eyes, mouth and broken skin. It is recommended that a small 24-hour test patch be done prior to initial use. For external use on animals only.